These frame earrings developed out of an idea I had whilst thinking about the different value people place on different types of jewelry and the materials they're made from. When people who aren't beaders look at my beadwork, they may admire the piece or recognise the time spent on it but it is often dismissed as ‘just beads' or ‘just glass'. Whereas they often look at my wirework pieces, which may have taken hours less to make, and cost less in materials, and place more value on them. I spent a long time making pieces that fit in with this idea but very quickly I began to lose the enjoyment of making pieces. This led me to want to explore the situation and my frustration at it. I decided that I would get back to beading and spend as much time as I wanted, and use the beads I wanted, to make earrings that I liked- purely for the enjoyment of it. However, as they needed to be practical and wearable, there needed to be some wirework in the earrings, so I set myself the challenge of not spending more than one minute per earring on the wirework side of it and seeing what I could come up with in that time. I wanted as many different variations as I could get without lots of tools, silver or time. I also wanted the earrings to be made to the same scale and along the same theme; the aim was for the beadwork, the colours and the beads to be the main feature with the silver performing a mainly functional role. I had the idea to frame the beadwork using one colour bead to highlight the designs, this is where the name of the series came from. The beadwork in each earring takes at least 1½ hours and I have so far beaded four different pairs. 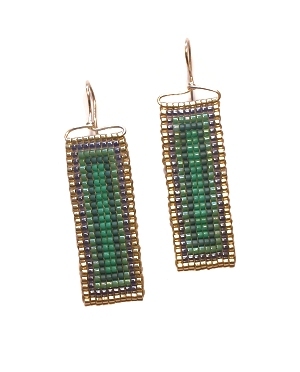 This pair use coloured stripes as the design and a simple wire hanger with a wrap to turn them into earrings.